Favorite Fall Treat – Buckeyes! I used to live in Ohio in elementary school, and my mother would always make Buckeyes around Halloween (chocolate covered peanut butter rolls). I’d help roll the dough/batter into little balls and dunk them in the chocolate. My favorite October/November treat! Almost better than Reese’s Peanut Butter cups, but with extra love. In a large bowl, mix together the peanut butter, butter, vanilla, and sugar. The dough will look dry. Roll into 1in balls and place on wax paper-lined cookie sheet. Press a toothpick into the middle of each ball (to be used later for dipping), and chill in the freezer until firm (about 30min). Melt chocolate chips in double boiler or in a bowl set over a pan of barely simmering water. Stir chocolate frequently until smooth (do not leave unattended). Dip cold peanut butter balls in chocolate holding onto the toothpick. 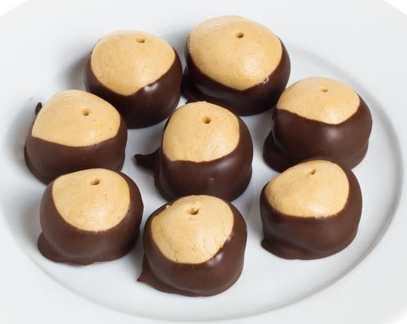 Leave a small portion of the peanut butter showing at the top to make them look like buckeyes. Put back on the cookie sheet and refrigerate until serving.